Oh no! It looks like your pet may have some kind of intestinal parasite! Intestinal parasites are parasites that live inside a host’s gastrointestinal tract. Some feed off of the nutrients that the host ingests while others ingest the host’s blood. Whatever their food of choice may be, they can cause numerous issues for the host. While some parasites are large enough to see with the naked eye, this is not the case for all of them. For example, tape worms break apart and are usually passed as segments which can look like small grains of rice in your pet’s stool. Round worms resemble noodles or string. Others are much, much smaller and you may not physically see them in your pet’s stool. These parasites can cause all sorts of issues for your pet. How do cats and dogs get intestinal parasites? Parasites are usually transmitted when an animal inadvertently ingests parasite eggs or spores in contaminated soil, water, feces or food. In the case of tapeworms, they can also be transmitted when a dog eats an infected flea. Puppies and kittens, on the other hand, usually get intestinal parasites from their mother. Transmission can occur in uterus or from nursing. Many intestinal parasites are zoonotic, meaning that they can also infect humans. Simply practicing good hygiene is usually enough to prevent this from happening. You should always remove your pet’s stool from the yard and be sure to thoroughly wash your hands afterwards. The same goes for your cat’s litter box. Wearing shoes while outside can help protect you against hookworms. But don’t worry – these pesky parasites are easily treated! There are many types of dewormers available. Some parasites can be seen in the stool, such as tapeworm segments or roundworms. Others are much, much smaller and harder to detect. Here at TLC Animal Hospital, we send your pet’s stool to an outside lab for thorough testing to identify which parasites are present to ensure that the correct dewormer is used to treat any and all parasites that your pet may have. Some dewormers require a second dose that is given a few weeks later to ensure that all of the parasites are gone. Depending on the parasite, repeat testing of your pet’s stool may be needed as well once treatment is done. While there is, unfortunately, no way to 100% prevent against intestinal parasites, there are steps that you can take that will drastically reduce the chance of your pet becoming infected. 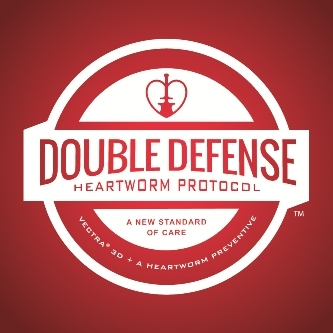 Most monthly heartworm preventatives also contain a broad spectrum dewormer. This helps get rid of any eggs or larvae that your pet may have picked up during the previous month. Picking up after your pet helps reduce the chance of any eggs or larvae from getting into the soil. The best way to prevent against tapeworms is to use a monthly flea preventative. Having your yard treated by an exterminator for fleas will also help. The less fleas there are in the environment, the less of a chance your pet has of eating an infected flea. As we’ve written about before, every pet should be on a monthly flea preventative, even if they are strictly indoors. Read more about the flea preventatives that we offer in our previous post to help you decide which preventative is the best for your pet’s lifestyle. If your pet is not already on monthly parasite preventatives, take them to your veterinarian to discuss how you can protect your pets and family from intestinal parasites. Remember that the best way to protect your pets against parasites is to keep them on parasite preventatives and have their stool checked at least once a year. If you have any questions or concerns, you should always contact your veterinarian. They are your best resource to ensure the health and well-being of your pets. Ahh… Southeast Texas. Clear Lake right outside our back doors, Galveston just down the road, and Houston not too far when you need a night on the town. We’re right in the middle of fabulous shopping, great restaurants, and a variety of outdoor leisure – we’ve got it all! But this ideal location means we also have these wonderful little monsters that thrive in the marshes and torment us all summer – they also never go away. I spend a good amount of time in the marshy wet lands all year long, and even in November and December I am usually donning the fancy aroma of OFF! to keep from being eaten alive. Now, I only have myself to blame for being subjected to this form of torture, but at least I know my perfect duck hunting pup June doesn’t have to go through the same since we started using the Double Defense program last summer. We all know mosquitoes carry some terrible diseases that can gravely affect humans, like malaria, West Nile and Zika virus. But did you know the same mosquitoes spread heartworms to dogs? In the past, preventing your dog from getting heartworms was as simple as giving them a tablet every month but heartworms have begun developing resistance to these medications. 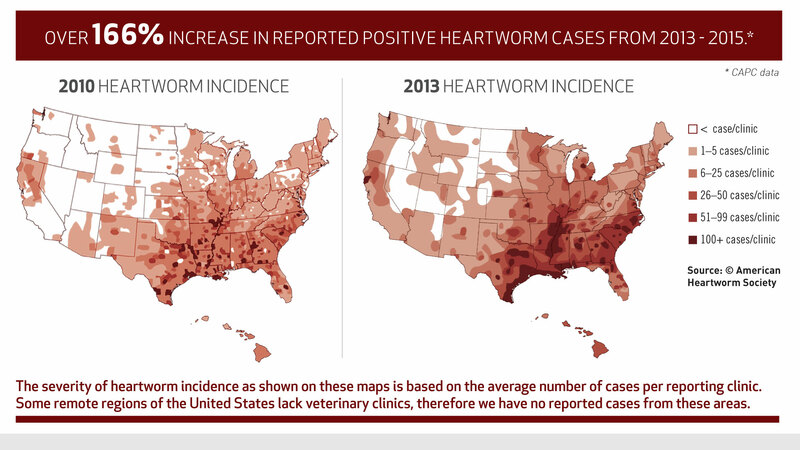 These resistant strains of heartworms have now been found in all 50 states. The American Heartworm Association is the leader in keeping us up to date with the newest heartworm prevention protocols and allowing us to pass these on to you in order to protect our pets as much as we can. They are recommending that veterinarians offer a topical preventative that repels mosquitos to use along with your monthly heartworm prevention. This is called Double Defense, and is a protocol that not only the AHA is recommending, but AAHA is backing this as well. Vectra 3D for dogs, by Ceva, not only repels and kills mosquitos but it also kills and repels fleas, ticks, and flies. Keep in mind-while oral preventatives work wonderfully, they have no repelling action and do not prevent your patients from being bitten, thus contracting a disease. When you consider a dog can be bitten over 80 times by mosquitoes in a single evening, it’s not hard to see the importance of protecting your dog against mosquito bites just like you protect yourself and your family. Don’t let fleas get in between you and your pet(s)! Using these helpful tips will allow your home and pets to be flea free! Have you ever come home and the only thing that has been on your mind all day is sitting on the couch cuddled up to your furry friend? Imagine that time is now and this is what you are doing- you plop down next to your loving pet, you take your hand to start petting him or her and look down… Aagh! All you see is tiny little fleas scurrying around! What do you do?? You just applied the medicine a couple of days ago! Don’t worry; this happens to the best of us. Even though you are seeing fleas, don’t just assume that the flea preventative that you purchased from the clinic is not working; in order to ensure that these preventatives work properly, we need to make sure that they are being administered or applied correctly. There are many topical preventatives available on the market for fleas. Vectra 3D for dogs is available for purchase at our clinic. It is waterproof, photo stable (meaning it does not break down in light), and will kill and repel fleas, ticks, flies, mosquitoes, lice and other mites and is easy to apply. Simply part the hair at the base of the tail and using the applicator tip, squeeze the tube gently while working up the back towards the neck, or from “From rear to ear” as we like to say. Once applied, the Vectra will begin to absorb into the sebaceous sweat glands of their body and translocate. When this is happing your pet may feel a tingling sensation and will want to roll around on the grass, ground, couch, etc. If allowed to roll around or rub on the furniture, your pet will end up applying most of the preventative onto something else and thus it will not be as effective. After applying the Vectra 3D, be sure to keep your dog distracted for a good 15 minutes after application, so that the liquid can absorb. This can be done by taking your dog for a walk, throw the ball for them or give them a rawhide to chew. Other topical preventatives have different ways to applying them to your pet. Always read the instructions before applying. Another important thing to remember with all topical preventatives is to not apply them when your pet is wet. They should be applied either 48 hours before or 24 hours after a bath. Also make sure that you are bathing your pet with a pet shampoo that is soap or detergent free. Human shampoos are designed to cut oil and grease and will wash the product off of your pet. Be sure to remove all collars until the product is dry. Don’t forget about your cats! Just because they never go outside does not mean that they should not be protected too. Flea eggs and larvae can be brought into the house on your other pets, shoes and even the hem of your pants. Revolution for cats prevents heartworms, intestinal parasites, ear mites and fleas. It should be applied to the skin on the back of the neck, just high enough where your cat is not able to lick the medication. Cats can sometimes be difficult to keep distracted after applying the topical medicine. The best way that I found to do this is when it is time for them to eat or initiate them in play after application with a ribbon toy, laser pointer, etc. If you are using an oral form of flea prevention such as Trifexis, Comfortis or Nexgard, make sure that your pet has eaten a full meal prior to giving the medication. This will ensure that the medicine is absorbed properly and will reach its maximum effectiveness. If you are using one of these medications and you are still seeing fleas on your pet, please remember that these types of preventatives only work once the flea has a blood meal, meaning the adult flea has to bite your pet in order for it to die. Did you know that the fleas that you are seeing on your pet are only 5 to 10 percent of the whole population of fleas that live in your environment?! Just because you are seeing fleas does not mean that the product is not working. There are likely thousands of fleas in your home and in your yard and the fleas that you are continuing to see on your pet are most likely new fleas. When the female flea has her first blood meal she will lay up to 50 eggs. In the female flea’s life time she can lay up to 5000 eggs. How do we fix this problem? The truth is, there is no silver bullet for fleas! The flea life cycle is 90 days and as fleas continue to hatch out into the environment, you may continue to see them. In order for the products to kill the fleas, they must first come into contact with your pet. For optimal flea control it is ideal if you treat your environment as well. 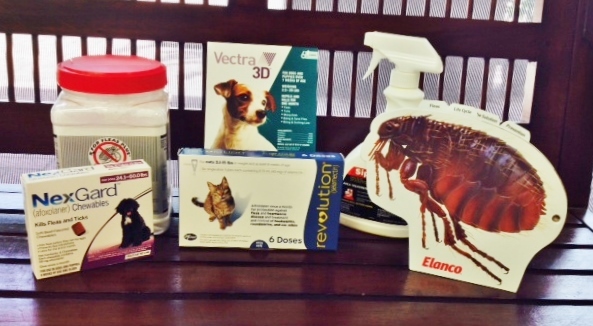 There are a variety of products on the market that are available to you and will help to eliminate the fleas in your home and yard. When treating the inside of your home, be sure to think about where your pets spend most of their time. Where ever your pet spends most of his/her time will be a hot spot for flea activity. If yours is anything like mine, you will need to pay extra attention to the couch and even the bed. Because the flea eggs, larva and pupae are very sticky and hang out on any material and fabric until they can find a host to live on and dine, be sure to strip the bed of all covers, and sheets along with the comforters and bed skirt, also remove all pillow cases. You will need to wash all these items in very hot water. While you are washing your bedding, you will need to treat the bed. We carry a product at the clinic called Siphotrol Plus Spray. This spray can be used to spray down all sides of the mattress, box spring, under and behind the bed. In addition to spraying your bed make sure to treat all the other beds in your house and all furniture. Remove all cushions on the couch and spray beneath them and between the seams. Don’t forget to spay underneath all the furniture as well. Now let’s think about the carpet, you can use the Siphotrol Plus spray for all the carpet but it will be ideal if you were to take a powder treatment and sprinkle it onto the carpet. Flea Busters is a good product for this and can be sprinkled everywhere in the house including hard wood and vinyl floors. It is safe, odorless and easy to apply. Follow the step by step directions found on the label when applying to carpet. When treating your hard wood flooring, sweep the powder around the floor so it can be worked in between the cracks in the flooring. Let it sit on the hard flooring for about an hour then you can take a mop and just PLAIN water and mop up extra powder. When you vacuum make sure to throw away the bag or take the trash out immediately. Another important thing to do is remove the filter of the vacuum and wash it. When you are having trouble with fleas in your home, Flea busters recommends increasing the frequency of vacuuming. The vibration from the vacuum will draw the fleas out of the pupae stage. When treating your yard, it is best if you go to your neighborhood Lowes or Home Depot and get a product called, Bayer Advance. It comes in many forms including granules, sprays, and even hooks up to your water hose. If you have a large yard, you may want to call your local exterminator for recommendations. When you are treating your yard make sure that you treat everywhere your pet goes. If your furry friend has access under the house you will want to treat under there as well. While doing the outside also get the dog house, the garage, and the children’s play house. And don’t forget about the area under the big oak tree where he or she likes to rest under on sunny days. Also, don’t forget to treat your car if your pet rides with you to places. The Siphotrol Spray can be used to treat the inside of the car. FALSE! Most people only think that flea prevention is for pets that are only outside—but remember it just takes 1 flea to cause a huge outbreak in your home. Flea eggs and larvae can be brought into the home on your shoes and clothing and any pets in the home that are not protected run the risk of getting fleas. FALSE! Adult fleas can live outside in temperatures as low as 49 degrees. If the fleas are sheltered in your home, garage, etc. they will survive in even colder weather. The pupae stage of the flea life cycle will not die in any type of weather condition, and can live up to a year until weather conditions are ideal for them. All flea preventions should be administered every 30 days in order to prevent infestations. Using all these steps it will help you combat fleas all year long. If you have any questions or would like help deciding which preventatives are best for your pet(s), feel free to call or stop by the clinic and we would be happy to assist you!